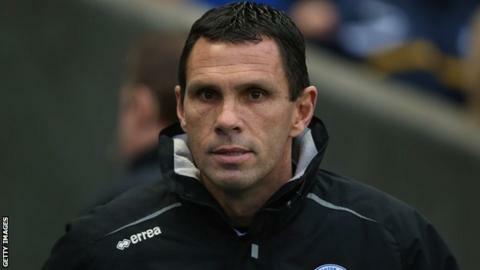 Brighton boss Gus Poyet has called on his side to pace themselves when they face Arsenal in the FA Cup. The Seagulls host the Premier League club in the fourth round on Saturday. Poyet told BBC Sussex: "I want to make sure we don't give everything in the first 30 minutes. The opposition [will] keep running and fighting for longer. "We need to be a bit smarter. I want to see my team playing the same kind of football but being more intelligent in terms of how we do things." Poyet has promoted a passing style since his appointment as Albion boss in November 2009, while Arsenal are well known for their slick passing game. Brighton knocked out a weakened Newcastle United side in the third round but the Uruguayan has warned that the Gunners will pose a different challenge altogether. "[It's about] how we defend when we don't have the ball, the energy we spend at the beginning of the game and how we manage to deal with a top class team," Poyet added. "We must not go and give everything from the first minute. Otherwise after 20 minutes everybody is dead and we cannot do anything else." Poyet hopes his side will remember the lessons learned from their fifth round exit last season, when the Seagulls were beaten 6-1 by Liverpool at Anfield. "Our first 35 or 40 minutes against Liverpool were a really high standard," he said. "But then we were finished, it was over and we were not able to compete. Brighton & Hove Albion have not played Arsenal since 1988. The two sides last met in an FA Cup fourth round tie at the Goldstone Ground, with Arsenal running out 2-1 winners. In 12 meetings since the Second World War, Arsenal have won eight while Brighton have two victories. "The tension of the players, going to Anfield and trying to give everything took over the head and we lost it." Poyet has spoken of his admiration for Arsenal boss Arsene Wenger and his achievements ahead of the match at the Amex Stadium. Wenger has won three Premier League titles and four FA Cups since taking charge of the north London outfit in 1996, but the Gunners have not won silverware since lifting the FA Cup in 2005. "He has to be up there with the best in history in English football," Poyet said. "Sir Alex Ferguson is the best, not only because of the time spent there but because of the titles and trophies. He [Wenger} has to be there, second. "I think it is the dream of every manager to be in a club where you have the support of the whole club behind you - they give you chance to play the way you want to play, they respect you in how you want to bring players in, and you stay at the club through the good times and the bad. "People think bad times are to finish fourth but that is not really bad nowadays."